How to Organize Your Kitchen to Help You Lose Weight. If you’re serious about slimming down, you’ll want to create an organized kitchen. Why is eating at home so important for weight loss? Put simply, home cooking equals healthier eating. By making your kitchen environment organized and welcoming, you’ll be more likely to want to eat in. Storing nutritious foods in a way that encourages you to eat them—for instance, on a counter or low shelf as opposed to buried in the back of the fridge – will help you reach for healthy choices first. 1. Make room for healthy foods. Is your fridge so jam-packed you can’t even see into it? Are your cabinets so cluttered that stuff often flies out when you open them? It’s time to do a quick cleaning and reorganizing. After all, the foods in your kitchen, where they’re stored, and how accessible they are can all affect how much and how well you eat. Start by tossing unhealthy items or putting them in places that are harder to see and reach. Also get rid of any expired foods. Reorganize the remaining foods, using the prime real estate in the fridge—accessible shelves and drawers—for healthy foods, such as vegetables and fruit and nonfat dairy. Do the same thing in your cabinets: Make sure you have a space front and center for the healthy stuff. When putting foods away, store the items with the label and nutritional facts facing toward you. When you go to reach for the item, you’ll be more inclined to check serving sizes and calorie counts to make sure you’re doling out the right amount. 2. Store in style. 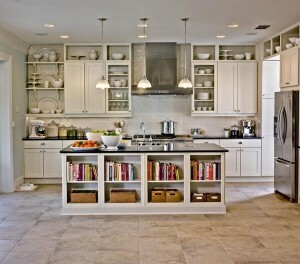 Another way to help organize your space is to invest in stylish, functional, clear storage containers. This will help you easily store cooked veggies, grains, poultry, fruit, and premade salads. 3. Organize utensils and cooking pots. When you need to cook or prepare healthy meals, you’ll need to have your cookware and utensils handy. Colanders, spoons and spatulas, saucepans, a wok, pots and pans, a grater, a garlic press, and steamers should all be readily available. 4. Think ahead. Prepare healthy lunches, dinners, and snacks for busy weekdays in advance. Think about what the coming week looks like, and aim to cook more balanced meals for yourself. You’ll save cash (takeout and delivery aren’t cheap), calories (remember, homemade equals healthier), and time (you don’t have to rush to pack lunch in the morning if it’s already made). 5. Create your own portion-controlled snacks. Those 100-calorie snack packs can be a great way to enjoy a small amount of your favorite treats, but let’s face it, they don’t come cheap. Save some cash by creating your own: Buy your snacks in bulk and use your own containers to portion out your desired serving size. Store them in your pantry for easy access to a quick snack. Thank you for posting this helpful post! I have been finding for a good idea step by step on how to organize the kitchen. Now I get this ad apply to organize my own kitchen.